United India Insurance Company Limited (UIICL) has released ONLINE Interview Call Letters to the qualified / short listed candidates called for interview round for total 323 posts of Administrative Officers (AO) scale I for Finance, Automobile Engineering, Legal and Generalist disciplines. The online written exam was held on 28th December 2014 for 323 posts of AO Scale I in various departments at various centres in all over the country. Huge numbers of candidates had appeared in the exam. Now it is the latest news that these shortlisted candidates/ qualified candidate in written exam are called for the 2nd stage of Interview which is going to be held on 9th February 2015. 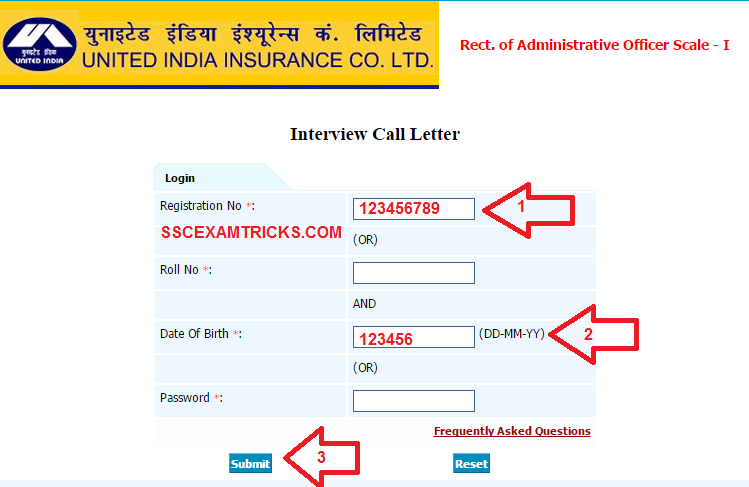 Those candidates who had appeared in the exam and waiting for the result can download their interview call letters from the direct link provided in the end of the post. · Enter Registration ID or Roll No. and Date of Birth or Password of the candidate. · Download the interview call letter in PDF. · Save or Print the Interview Call Letter for Interview Requirements. The Final Selection will be done on the basis of performance in the interview (interview marks) of the candidate and marks obtained by the candidates in the Main Exam conducted by UIICL. The list of Final Selected candidates will be released on the official website of UIICL. Click here to download the complete selection process of UIIC Administrative officers. Click here to download Interview Data Sheet of the candidate for UIICL AO.